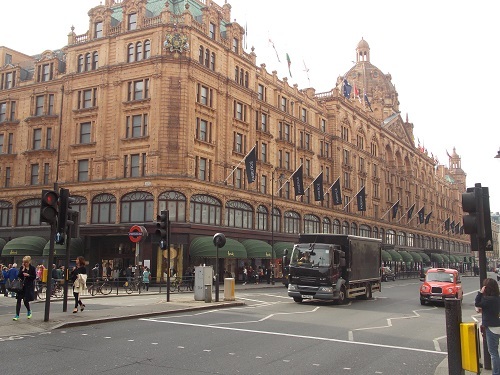 Harrods is one of the most famous department stores in the world, it is located in Brompton Road in Knightsbridge. The store occupies a 5 acre site and has over a million square feet of selling space in over 330 departments, it is the largest department store in Europe. Harrods was founded in 1834 by Charles Henry Harrod who had run a number of businesses all over London. In 1849 he relocated to Brompton and took over a small shop on the site of the present store. Harrod’s son Charles Digby Harrod developed the business selling medicines, perfumes, stationary, fruit and vegetables. The great success of the store enables the store to expand as adjoining buildings were acquired. However the success was dampened by a fire in 1883 when the store burnt down, however this did not deter Charles Harrod who made sure all his orders were fulfilled on time. A new building was built on the site and the store gained a reputation for being the local shop for the rich and famous. The store was the site of the first moving staircase or escalator in London 1898 although it was not an instant success as many customers were scared to use it. In 1959 Harrods was bought by the House of Fraser group, and in 1985 the Fayed brothers bought the store. From 1985 to 2010 Mohamed Al Fayed worked hard to consolidate Harrods position as one of the most famous stores in the world and make good its boast that it will provide the customer will almost any service for a price. In 2010 Harrods was sold to Qatar Holdings for an estimated 1.5 Billion pounds. Harrods has been the victim of a bomb attack when six people died in 1983 and has a high security presence due to the luxury goods on the premises. Up to 300,000 customers visit the store on busy days, they are served 5000 staff in 330 departments. There are 32 restaurants, personal shopping, a bank, a barbers shop, amongst numerous other services.